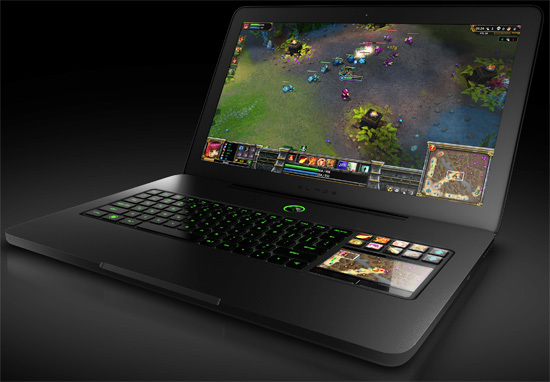 Razer’s powerful gaming laptop, known as the Razer Blade, was unveiled at PAX in Seattle not too long ago and is already set to be upgraded to a more powerful version. The new model will come with more processing power and onboard storage and still be able to keep its thin profile. However, the best part about this upgrade is that it also shaves a couple hundred dollars off of the price. There weren’t a lot of complaints with the first version of the Razer Blade, which was lightweight and only measured 0.88″ thick with a 17″ display and a $2,800 price tag. Sure, the price may seem a bit high for most people, but anybody who spends any amount of time researching high-power gaming laptops knows that they aren’t cheap. The new model will start shipping on September 30 and looks exactly the same as the current version, on the outside, that is. The inside houses quite a few upgrades, including a hybrid hard drive that pairs a traditional 500GB hard drive with a faster 64GB SSD drive. A new third-generation Intel quad-core CPU is also included. According to CEO of Razer Min-Liang Tan, “We’re one of the first companies to incorporate this chip. It’s an incredible processor.” But that’s not all that’s new. Razer has also upgraded the Nvidia graphics chip. “In short, the new Razer Blade is twice as fast as its predecessor and it is right up there with all the traditional gaming laptops, but it’s got phenomenal portability,” Tan added. Most gaming laptops, while more portable than a desktop PC, are still kind of thick, measuring an average of 2″ thick or more and weighing at least 10 lbs. The Blade is, as I mentioned earlier, 0.88″ thick and weighs in at under 7 lbs. The Swtichblade user interface on the Razer Blade will soon accommodate more games and allow developers to make customized icons and maps that tie in-game locations to the 10 special keys and LCD touch panel. During PAX, Red 5 CEO Mark Kern is expected to demonstrate its new Firefall shooter using the Switchblade functions. In addition to Firefall, games like The Elder Scrolls V: Skyrim and Battlefield 3 will also be adding custom icons and things for the Switchblade as well. The original Blade’s 30-day inventory sold out within 30 minutes of becoming available and those sales have allowed the company to drop the price of this new model from $2,800 down to $2,500. Pre-orders will become available on September 2 on Razer’s website for the new model, which also features upgraded USB ports and dual WiFi for faster connections. A noteworthy piece, thanks from a huge gaming addict! !.